If your parents ever told you that playing video games is a waste of time, the joke might be on them. Many video game lovers have turned their passion into profits and anyone can follow suit. 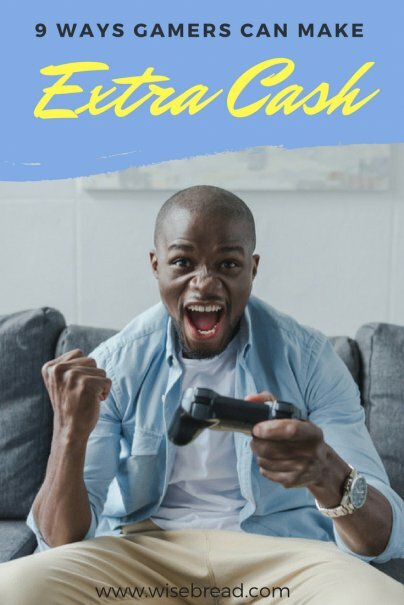 While making extra cash on video games is a lot more work than you might initially imagine, here are the top ways to do so. You can invite fellow video game fans to watch you play during livestreaming with Twitch. While you can upload prerecorded videos of yourself playing, most of Twitch's viewers are there for the livestreaming. How do you make money on Twitch? There are a few different ways. You can make money through ad views, similar to how individuals make money on YouTube. You can also include Amazon affiliate links for the game you are playing. Twitch streamers with large followings also get paid to do sponsorships, sell their own merchandise, and collect donations from fans. YouTube is notorious for making expert gamers into millionaires. Popular gamers Daniel Middleton, age 26, earned $16.5 million in 2017, and Evan Fong, age 25, earned $15.5 million — all through posting videos of themselves gaming. What earns the top gaming channels big money is expert game-playing skills paired with a winning personality and great video editing. Game testers play new games and give their honest feedback. While game testing sounds like a fun experience, keep in mind you won't be playing your top choice games — and instead of enjoying the gaming experience, you are essentially hired to hunt down glitches. Apply for game beta testing positions at PlaytestCloud and VMC Global Beta Test Network. Popular games like Counter-Strike, Dota 2, and World of Warcraft have allowed players to profit on collected in-game items, such as weapons and skins. Marketplaces like Steam and Gameflip make it easy to list popular game items. Recently, a scorching talon from Dota 2 sold for just over $53 on Gameflip, and certain Counter-Strike weapons sell for over $1,500 on Steam. With so many free game walk-throughs available, it can be hard to stand out. However, creating guides on games that are not as mainstream can help you make a name for yourself. Look at Twitch's directory to get ideas on what content to create. For example, Fortnite has almost 20 million followers and guides are easy to find online. But games lower on the list have much fewer followers, and guides may be harder to come across. Creating one and selling it on Amazon could prove profitable. The best gamers eventually find themselves playing in tournaments. There are tournaments for several popular games and the prize money is substantial. For example, prize pools for the Call of Duty World League have awarded hundreds of thousands of dollars to competitors. What's a gamer to do when they run into a problem during game play? Contact customer support. Companies like Sutherland Global and VMC hire gaming support agents. Some of these positions are fully remote. Gamer Sensei connects pro-gamers with players who need one-on-one coaching. Individuals sign up for coaching to improve their game-play strategy, usually in the hopes of performing better in a tournament. Some coaches charge as much as $187.50 per hour.